The Oslo tragedy may turn out to be a portent of social cataclysms in the Old World, whose people are tardy in reacting to the many challenges of globalization. When an office building housing several federal agencies was blown up in Oklahoma City in April 1995, few people doubted that this terrorist attack had been perpetrated by Muslim fanatics, who two years earlier had tried to blow up the World Trade Center in New York. To Americans’ horror, the attacker was 27-year-old Timothy McVeigh, a Persian Gulf war veteran and a white, ultra-right radical. The Norwegian nightmare is reminiscent of these American events. Theories about Islamic, Kurdish and Libyan trails quickly gave away a shocking fact: the massacre was staged by a bona fide Norwegian named Anders Behring Breivik who even looks like a “ideal Aryan” from films by Luchino Visconti and Bob Foss. The Oklahoma City tragedy looks like a sinister epigraph to America’s further development. Timothy McVeigh wanted to punish the ”tyrannical” U.S. government for what he and other ultra-rightists thought to be a flagrant encroachment on civil freedoms. Fifteen years later, during the 2010 Congressional elections, politicians who shared that mood stole the show. The Tea Party movement, a recent occurrence that consists of a motley assemblage of right-wing populists, isolationists and ultra-conservatives, holds the federal government as almost enemy number one. That tradition is rooted in the history of the United States. In recent years, however, the polarization of society, radicalization and mutual estrangement of parties that are not prepared to budge an inch even if it would make the situation still worse, has reached a frightening level. The social and political mechanism that has so far ensured consensus is fatefully misfiring. The nature of developments in Europe is comparable to that in America. There is a widening gap between the elites and the voters, who no longer know what to expect. Populist protest parties are mushrooming. Their position is isolationist and protectionist in the broad sense; they are up in arms against the inflow of immigrants, cultural diversity and market liberalization. As a rule, they associate it with European integration, an elite experiment of the second half of the 20th century pursued by the whole Old World establishment. While Norway is not a member of the EU, it is wedded to its norms and rules. There have always been right-wing trends in Scandinavia and there is a tradition of political coercion (especially in Sweden), but all that has been on the margins. 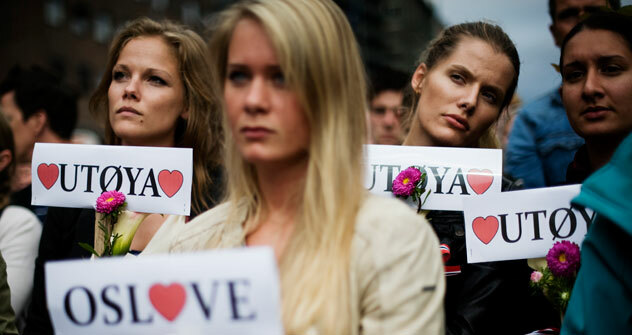 Most probably the act of Anders Breivik and his possible accomplices is an isolated act of crazed fanatics. But just as the Oklahoma City blast was a prelude to a precipitating crisis in an American society unable to cope with the fast-changing atmosphere and domestic change, so the Oslo tragedy may turn out to be a portent of social cataclysms in the Old World, whose people are tardy in reacting to the many challenges of globalization. A 2007 film by the Cohen brothers entitled No Country for Old Men is a fitting metaphor for the current crisis in America and the world. At the tail end of George Bush’s presidency, when 80 percent of Americans thought the country was going in the wrong direction, the film directors showed that the problem was not Bush, as many then hoped, but the flaws of society that appeared long before Bush and would not disappear with his departure. The unmotivated and totally dispassionate, yet somehow inspired violence embodied in the hero (played by Javier Bardem) destroys the social fabric, exposing human nature at its worst. People in the old mold can only shrug in shock. The absurdity of international politics in which the distinction between war and a humanitarian act is deliberately blurred resonates with destructive social processes in some countries creating a world in which there is no room not just for old men, but for people in general. The article was originally published in Moskovskiye Novosti.